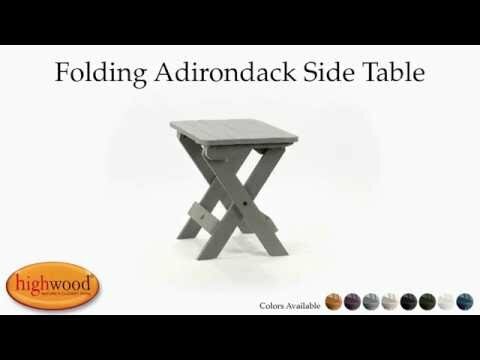 This side table is part of the Adirondack Collection but could equally be used with any of our chairs since it is so versatile. The piece neatly folds down for easy storage and transportation. Perfect for a day trip in the car to the park or the beach. No assembly is required, just take it out of the box and unfold. I use this table outdoors from the Spring through the Fall. I put flowers, lanterns, pumpkins or baskets on the table just outside our front door. During the winter months, I use this table in the family for snacks and beverages. It's the perfect height for my grandson to use when he's sitting on the floor playing with his action figures. I plan to buy an extra table to keep upstairs as well. It's lightweight and easy for me to move.